Spray 4-quart slow cooker with cooking spray. In slow cooker, place cheese product, Cheddar cheese and cream cheese. Cover; cook on High heat setting 1 hour, stirring occasionally, until cheese is melted. Stir in olives, tomatoes, spinach and garlic. Reduce heat setting to Low. Cover; cook at least 20 minutes but no longer than 2 hours. Cut thin round slice from top of bread loaf. Hollow out loaf by cutting along edge with serrated knife, leaving about 1-inch shell, and pulling out large chunks of bread. Cut top slice and hollowed-out bread into bite-size pieces. 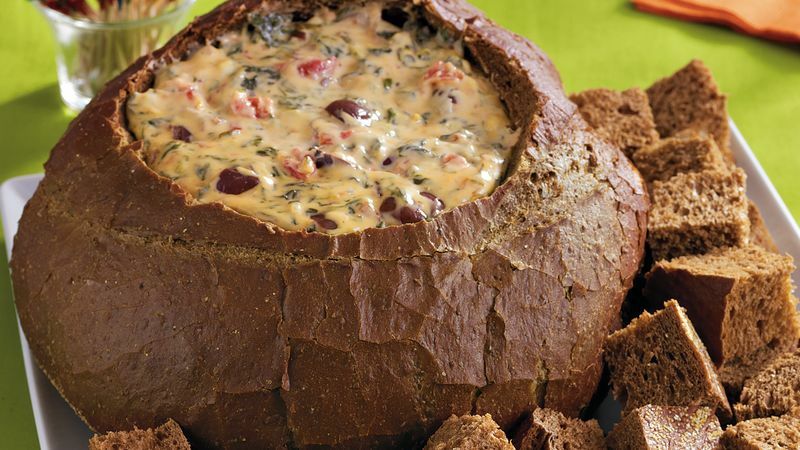 Place loaf on serving plate; fill with hot cheese dip. Arrange bread pieces around loaf for dipping.